19’ GOAL Solomon Warriors 1 – Marist Fire 0: Judd Molea puts Solomon Warriors in front from a freekick. A contender for the goal of the season the kick was taken on the right and the shot cruved in at the top corner of the goal on the opposite side. 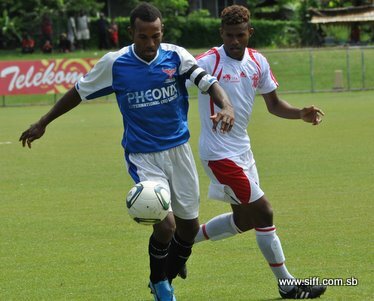 21’ GOAL Solomon Warriors 2 – Marist Fire 0: Chris Tafoa heads in Solomon Warriors’ second of the match. Molea (Judd) took the kick and the initial clearance was not good and dropped nicely for Tafoa who simply nudged the ball into the net. 25’ GOAL Solomon Warriors 3 – Marist Fire 0: Another cornerkick from Molea (Judd) produces another goal and this time Tafoa does not wait for the second goal as he goes in for the header himself. 33’ GOAL Solomon Warriors 4 – Marist Fire 0: Dennis Ifunaoa picks up a long cross from Molea (Judd) and beats Phillip Mango with a neat chip past the Marist Fire goalkeeper. 41’ Marist Fire win a penalty after Abraham Iniga was fouled by Hardies Aengari in the box. 42’ GOAL Solomon Warriors 4 – Marist Fire 1: Marist Fire get one goal back as Augustine Tagana scores the penalty with a shot to the top of the net. 44’ A powerful shot from Iniga forces a good save from Silas Seda. 47’ GOAL Solomon Warriors 6 – Marist Fire 1: The second half gets off to a fiery start as Tafoa completes his hat-trick after the Marist Fire defenders fail to clear away his first attempt. 48’ SUBSTITUTION: Alfred Pamoana is replaced by Cliff Omori for Marist Fire. 52’ GOAL Solomon Warriors 7 – Marist Fire 1: A pinpoint cross from Molea (Judd) finds the running Lea’alafa who chests the ball up before shooting into the back of the net. 54’ John Feraka goes close with a shot but a deflection from Aengari (Hardies) slows the ball down enough for Seda to make the save. 56’ GOAL Solomon Warriors 8 – Marist Fire 1: Donga dances in with an individual effort and scores Solomon Warriors eight goal of the game. 57’ GOAL Solomon Warriors 8 – Marist Fire 2: Jey Kepi pulls a goal back for Marist Fire after a through pass and good confidence saw him beat Seda. 58’ GOAL Solomon Warriors 9 – Marist Fire 2: Ifunaoa takes Solomon Warriors’ tally to 9 goals with a shot from outside the penalty box. 61’ SUBSTITUTION: Henry To’o comes in to replace the injured Lency Saeni for Marist Fire. 63’ Solomon Warriors win freekick and Molea (Judd) lines it up. The shot takes a deflection from a Marist Fire player and Mango goes high to tap the ball out for a cornerkick. 66’ SUBSTITUTION: Casper Aengari comes in to replace Micah Lea’alafa. 73’ SUBSTITUTION: Silas Seda is replaced by Alfred Lofana for Solomon Warriors. 76’ SUBSTITUTION: Jay Kepi is replaced by Norman Miniti for Marist Fire. 77’ SUBSTITUTION: Dennis Ifunaoa is replaced by Jamie Molea for Solomon Warriors. 80’ Molea (Jamie) picks up a loose ball inside the Marist Fire box but the shot is well wide. 85’ Mango makes an excellent save to deny Donga’s header. 89’ A freekick is awarded to Marist Fire but the cross is too long and the final pass misses the target player. 90’ 3 minutes of stoppage time is added. 90’ + 1’ Molea (Jamie) cross for Donga in the box but the shot does not find its target.